Were you able to quickly find the policy you’re seeking? Was it consistent with other related policies? These are just three of the core objectives under which this policy library operates. 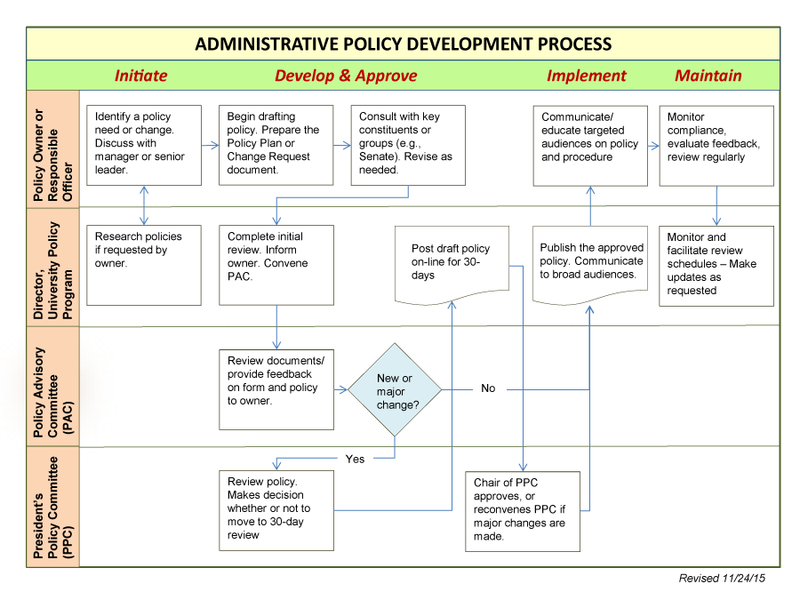 This page will share just some of the elements that have gone into creating a strong development and maintenance process for administrative policies. Our mission is to provide quick, easy access to well-written administrative policies and associated documents, so that all faculty, staff, and students are able to find and follow the rules that govern our University activities. We seek to continuously improve the tools and processes used throughout the policy life cycle by the University community, policy owners and senior leadership. The University has had an online policy library for more than 20 years. We were one of the first Universities to have created a centralized repository for policies. The tools have changed, the policy owners have changed, and the structure has changed, but throughout this time period, those involved have focused on providing a website and tools to ensure that end users could easily find and use the policies, and that policy owners had support (review and approval committees, templates, etc.). The Policy Library is the place to find administrative policies at the University, as well as procedures, appendices, etc.. It offers a variety of search tools to help you find the documents you need. The Forms Library hosts the administrative forms at the University. Forms are also linked to their related policies and can be found there as well.